Wn37 Asnelles, K.V.U Gruppe Bessin, K.V.Gr Bayeux. A lovely little seaside village. The 5cm KwK L.60 gun in an open emplacement (ringstand). 1 x R677 (but I think its an R669). 1 x R667 under construction. 1 x U Tobruk with an Pz.T FT MG.311(f). 2 x French Abri (air-raid shelters). Wn37 also had an anti-tank ditch running around behind it. Many anti-tank ditches were dug here but the British had the answer in bridge laying tanks. 8.8cm A/T gun inside a casemate..
Abri are French air raid shelters (more later). The R677 looks more like an R669? The R667 would have had another 5cm KwK gun when it was finished. 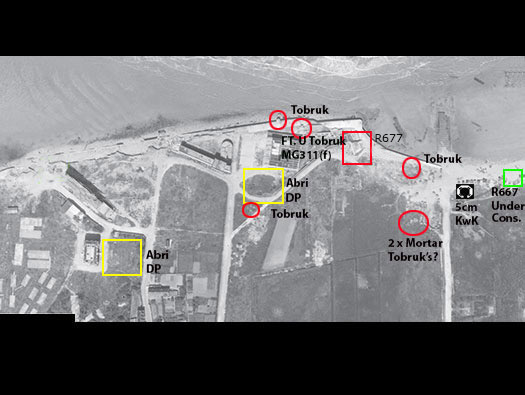 The two that look like Mortar Tobruk's would cover the whole area with a heavy barrage of bombs. The Tobruk's would probably have MG.34's. The U Tobruk with a French tank turret with a French machine-gun 311(f). An R667 was under construction. The first of the two French air-raid shelter. This is an Allied Bigot map of Asnelles. The line of anti landing craft defences, upside down U's are minefields. 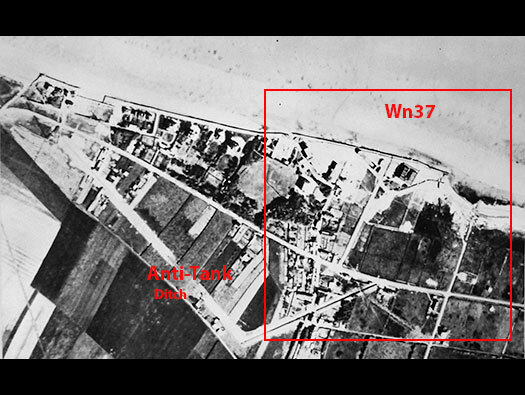 RAF photo processing of reconnaissance pictures. This is a view from Wn39. Wn 37 is down on the beach. 19 May 1944 An American PRU photograph from AH. The western end of Wn37 showing some of the old houses that were there. 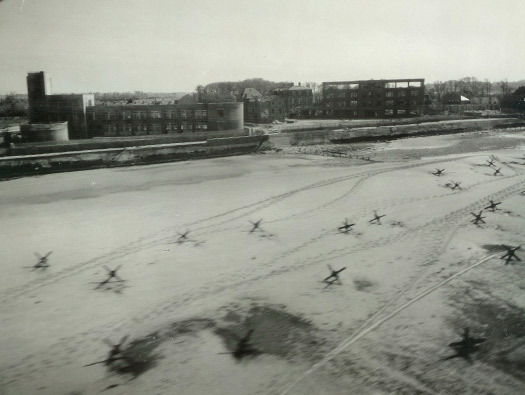 The picture taken by a Lightening of the USAAF PRU flight flying very low along the beach in May 1944, before all the beach obstacles had been planted. You can see the horse and cart and several groups of men assembling more obstacles. USAF Lightening PRU the type that took the low level photos. 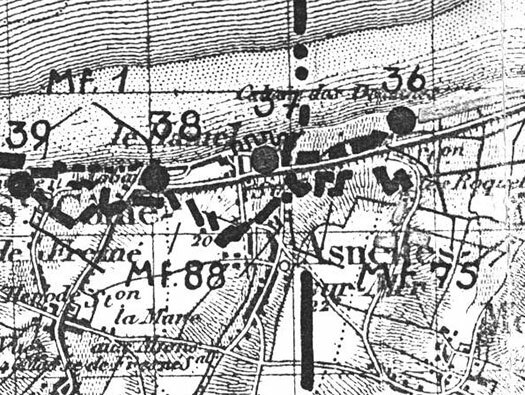 The start of Wn37 on the western flank. 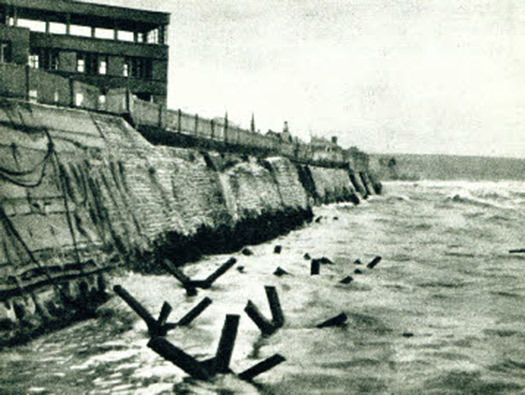 The sea wall has been battered by the sea and the war but you can see the Préventorium large buildings in the distance. Les Tourelles -Â ''Village Vacances du rÃ©seau Cap France Ã Asnelles sur Mer en Normandie''. One of the original prominent buildings. Information board with details of the buildings. very normative boards are along the sea front explaining the houses and their history. Along here was a Préventorium. Built to aid children who succumbed to TB and were brought to the coast for fresh air and sun. There were several here. Information Board 19 May 1944 An American PRU photograph from AH. A very low level photo of the beach front. 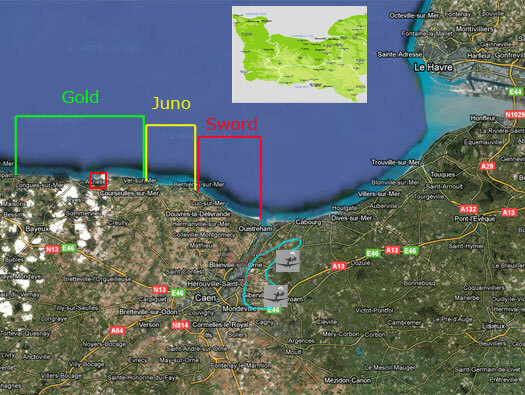 19th May 1944, I expect there were some very startled looks from the bunkers and Tobruk's in Asnelles. 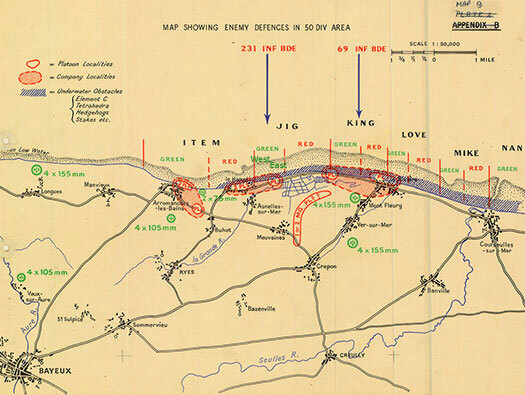 This is a German map of the area showing Wn's 36 to 39 and MF mine fields 1, 88 & 75 the black marks. BF58c Tobruk's. The anchor I believe was where part of the Mulberry Harbour was anchored. Tobruk defence with an MG.34. I believe (and I may be wrong) that this was used to anchor part of the Mulberry Harbour. 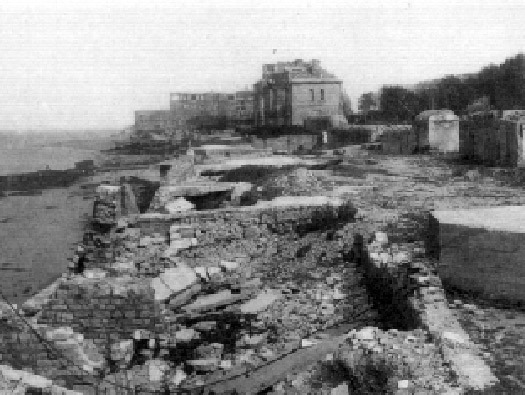 The ambulance dock landed near Asnelles where hospital ships ere moored and it was dedicated for taking off the wounded. Hospital ship docked at the ''Spud'' pier. This was one of the ramps made by British engineers to allow access to the beach/land onto the floating roadways..
A painting of how it may have looked. British tanks landing. These would have been the tanks of later armoured divisions or replacements for the ones lost. 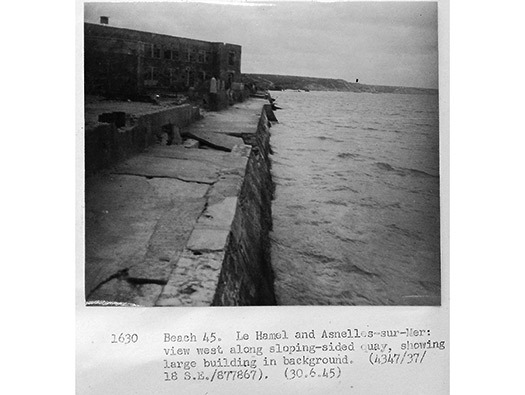 A photo from 30 June 1945 looking at the western Préventorium and the sea defences. Rommel sitting on his Asparagus..
A photo from 30 June 1945 looking very much like the one above but at high tide. This FT turret was a Maisy but there was one very like it here. The main defence in the centre. 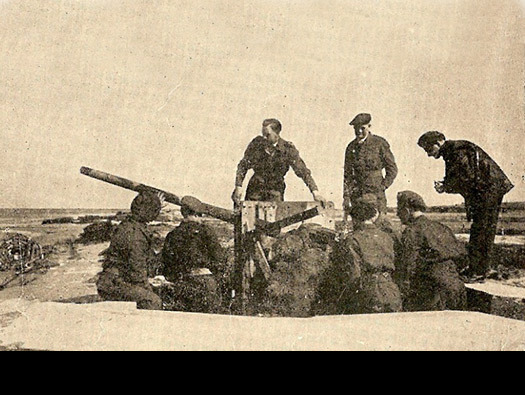 B - U Tobruk with an FT MG.311(f). C - It looks like a machine gun bunker/observation. D - R669 casemate (R612?). How "B"' may have looked. "C" - could be something like this machine gun defence? 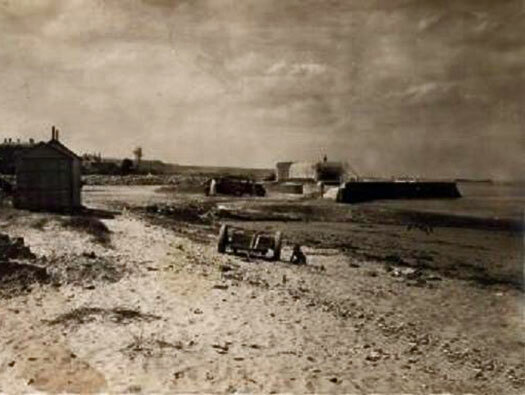 A zoomed in photo of two of the three large beach front Préventorium. Also the sea defences are a bit slim on the ground. 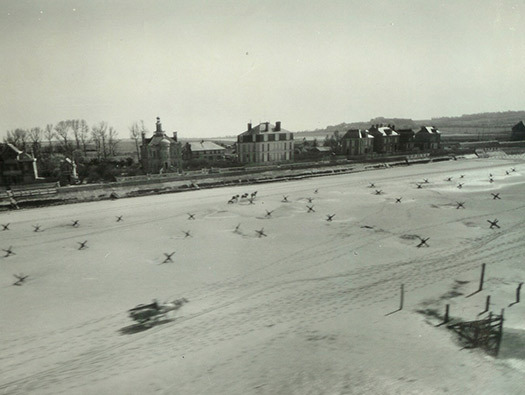 This picture taken at low tide 19 May 1944 and by D-Day a lot more obstacles were added. How 'B' may have looked. Note the horse and cart on the beach adding more defences. A picture taken in the 50's. Inside the R669 was 8.8cm Pak 43/41 that would have done a lot of damage on D-Day morning. My good friend John a tour guide had to take several Americans down the coast in two helicopters. 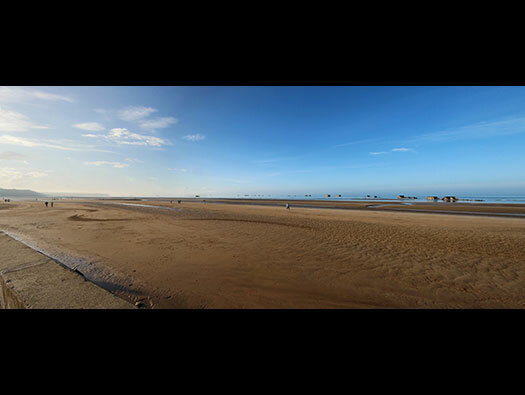 His good fortune are a set of photos from the Seine to Omaha Beach. One of the two helicopters. R669 with attached flanking wall. As I have noted earlier its stated as an R617 but it actually looks like an R669 and had an 8.8cm anti-tank gun installed. An R612 has the vent on the right side. The 669 has it on the left side. A 200mm exhaust vent on an R677. Memorial on the casemate. 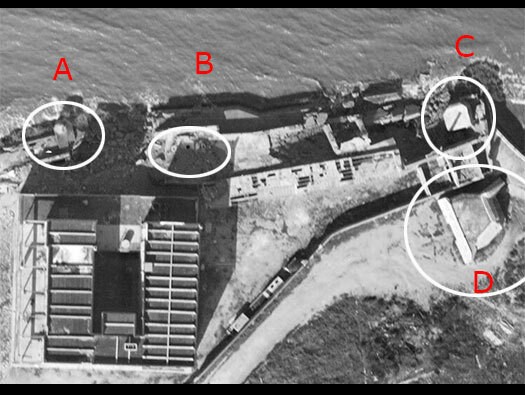 The casemate was doing a lot of damage along the British landings. 147th Essex Yeomanry Field Regiment RA, RHQ landed at 09.30 two hours after H-Hour. Sextant's of 511 Battery knocked out this casemate and another (possibly the 5cm KwK) at Le Hamel over open sights. Sextan in action, I believe with Polish forces. 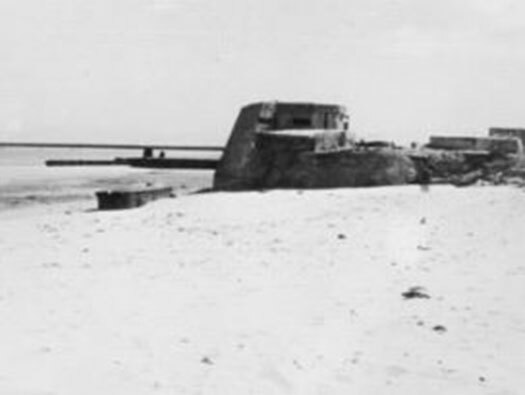 R669 casemate from the sea side. You can see the damage (not a lot) on the side wall and see the flanking wall covering the guns embrasure. Plan of the R669 casemate with the attached flanking wall and the internal foul air extraction. Another picture of the damage. This casemate was tucked away behind some walls know wonder it was not damaged by gunfire from the sea. The landward side and some more damage, it just shows how very well protected these bunkers are..
8.8cm A/T gun at Omaha beach. The rear view and the direction it was designed to cover. Extractor fan that sucked out the foul gases when the gun fires and pushes it out of the vent in the rear. Towards the eastern end first a Bf.58c Tobruk. Between here and the sand dunes was a 5cm KwK gun in an open ringstand, and a casemate under construction an R667 again for a 5cm KwK gun. There may have been two mortar pits somewhere within the defence. The Hampshires after landing turned towards Wn37 but were not strong enough to take the Wn also the tanks they expected to help them were either knocked out or too busy. The artillery forward observation officer had been lost also. 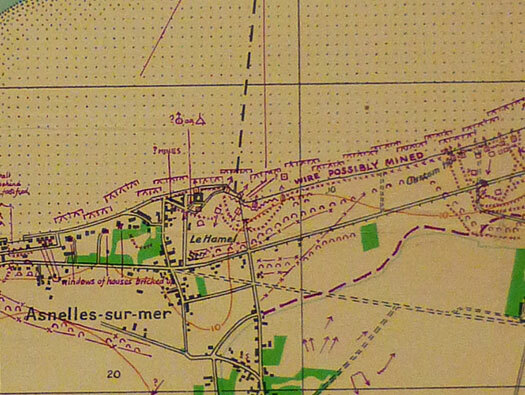 So they stopped attacking Wn37 and continued to help other units with taking Wn36 Roseau Plage. No.47 Royal Marine Commando landed after the Hants and were very badly shot up Wn37. Their job was to move inland as fast as possible, turn right and head for Port en Bessin and link up with the Americans from Omaha. They landed, turned right and then had to take Wn37 & Wn38 before they could continue on with their D-Day mission. R667 under construction a casemate for a 5cm KwK 39 L/60 gun. 5cm KwK 39 L/60 gun. The first French air-raid shelter. One of two shelters built here, a political incentive to protect its children in schools or hospitals by the per-war French government. The second French air-raid shelter. ''The resort is served from 1899 to 1932 by the Calvados Railways. 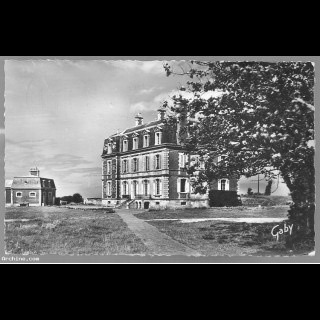 The construction of a sanatorium (Préventorium) for children whose one parent works at the National Society of French Railways, is imposed on the commune 1926 until the eve of World War II, it will accommodate more than 1,500 boys and girls''. Side view of the shelter. This is a picture of the rear of the house possibly pre war??. This is behind the house and huts show up on the air photos where these huts and other hut bases are, these may have been huts for the soldiers. Huts used to billet soldiers. 1st Bat. Hampshire Reg. landed at Jig Beach Green East. 07.40 AVRE's start to land. 07.45 1st Hants start to land. Jig Green being attacked by the Hampshires.